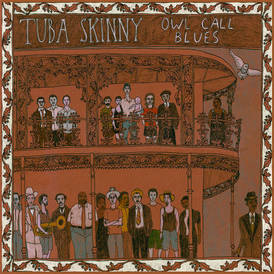 Tuba Skinny are a loose collective of musicians formed from the wide of variety of street performers in the ancestral home of jazz, New Orleans. They present a musical gumbo similar to that of the cultural mix of New Orleans itself and include new material influenced by depression-era blue, ragtime, hot jazz and traditional jazz. The selection of tracks on offer is a mix of wonderfully soulful vocals delivered by bass drummer Erika Lewis and up tempo instrumentals that display the virtuosity of cornettist Shaye Cohn and clarinettist Craig Flory. The stand out tracks include the fast and jolly instrumental Dallas Rag where we can enjoy the solo chops of the whole band and the Travellin’ Blues which is one of the many opportunities to sway along to the sublime fiddle playing of Cohn. It is the vocal tracks of Erika Lewis that leave me smiling the most, however. Her lazy drawl adds a bluesy tinge to each lyric and you could easily fall in love with that voice. From opening track Crazy About You through Got A Mind To Ramble to the title track Owl Call Blues the band deliver such a stylish performance that is seems at times to be drifting off to sleep. That this album is fresh and new and performed by musicians so youthful is testament to the fact that the music of New Orleans is still developing and that it needn't have the embalmed quality of so many British bands playing a version of tired, old trad. jazz. A fantastic journey through New Orleans and its myriad influences, Tuba Skinny and “Owl Call Blues” is the perfect blend of new and old with delightfully laid back vocals and bubbly cornet playing. This will be an album I will play to many of my friends.